Do you sleep with the phone next to your bed? Or worse, on or under your pillow with it pinging or vibrating with every text, Tweet, or notification? Do you feel insecure if your device isn’t nearby or on your person? If you say yes, to any of these queries, maybe it’s time for a digital detox. If we are going to preach to our kids to be less dependent on technology in their daily life, to limit their screen time, then we should model balanced digital habits ourselves. 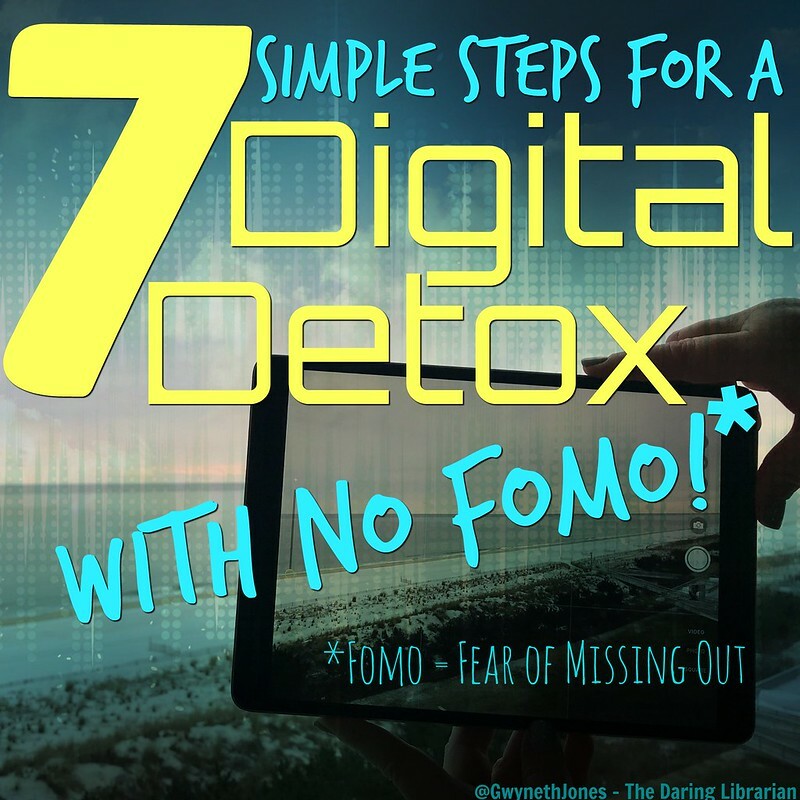 To help with that, here are seven simple steps for a digital detox with no FOMO. 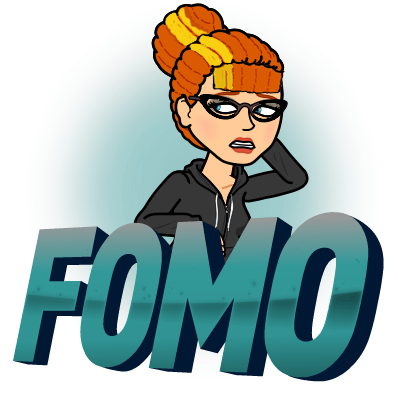 FOMO is something our kids feel every day. Many students come to us in the mornings to borrow device chargers because they fell asleep the night before with their phones on their pillows....not plugged in. But, now they're in a panic, wanting to miss a single Snap, text, or Instagram post, so they need a charge AND FAST! They worry that if they’re not posting a selfie about their life, they’re not living their best life. Sometimes grownups feel the same thing! Buy an alarm clock. Cell phones are not cuddly teddy bears, yet some people sleep with them - in their beds, some in their hands! I did a very unscientific Twitter poll (click or see below), and I asked my Education Personal Learning Network (PLN) friends if they sleep with their phones and was surprised by the many responses. Suzie Martin @librarynbct, a Nationally Board Certified Educator in West Virginia says, “Mostly I lay it on my abdomen if I sleep on my back. Otherwise, it's clutched in my hand.” Middle School Teacher Librarian & friend, Sarah Russo @librelearning says, “I sometimes sleep with it underneath my pillow....it’s what happens when I read on my phone and fall asleep!” Another teacher, Sherry Spier @TheExSPIERience, shared with me that, “I am in the minority. I keep my phone downstairs so I can't be bothered. It is the only time I can get a break. It also is less of a temptation that way. The only time I bring it upstairs is when there is the possibility of snow.” PollyAlida @pollyalida says, “I leave mine charging on a shelf across the room, sound turned off and do not disturb setting turned on.” Most of those that chimed in, said they sleep with it next to them and use it for their main wake-up alarm. I think this is just fascinating! Since I don’t have a landline, for safety’s sake, I do have my phone nearby. I keep my iPhone bedside, face down, with Do Not Disturb scheduled from 9pm to 6am, Night Shift activated. I don’t use it as my main alarm, and only allow calls from my favorites which include my family, my media assistant, and my admin. But let’s face it, alarm clocks are cheap. 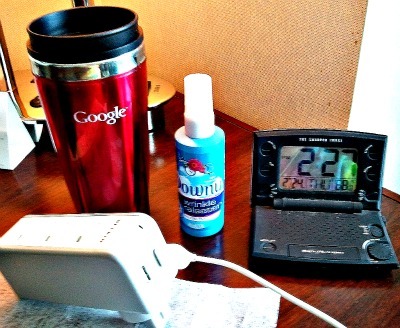 There are great travel alarm clocks out there for less than $20 bucks. Some even have a handy indoor temperature gauge. You could even use an Amazon Echo or Google Home to wake you if you don't want to go totally low-tech. Why not also give yourself 10 to 20 minutes, or even an hour, to ignore your devices as you get ready for the day with less stress? Get up, get dressed, have coffee, watch morning news, and maybe check your device only right before you step out your door. 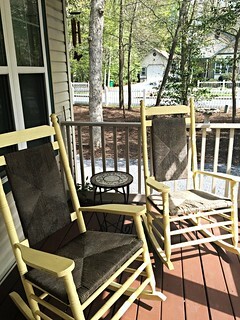 Start the day on your own terms, without worrying about the latest text, Tweet, push, or post. I have a lot Apps that I don’t use. 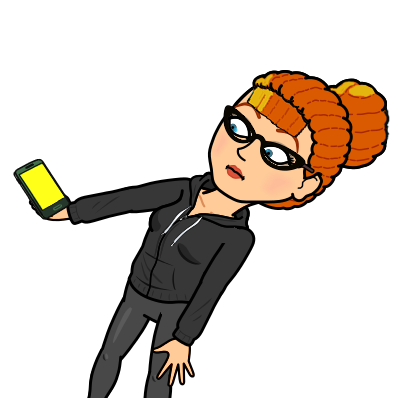 Every time I go to an EdTech or Library conference, read a cool blog post, or participate in a Twitter chat and hear about a neat new App, I invariably download it and never use it. If you haven’t opened an App lately, delete it. Not only will it simplify your life, but it will make your device work faster and better. You can always re-install it from the cloud or App Store later if you should discover it’s really necessary. But I’m going to bet you won’t miss it. Bye bye Flappy Bird, Trivia Crack, and Candy Crush and hello HQ Trivia! Push notifications were introduced to save you time by just glancing down at your phone without having to “open” it to keep in touch. But now push notifications can constantly interrupt your life or at least disrupt your workflow. Download more than a few apps and the notifications become a constant, badgering, beeping, buzzing, swooshing bit of nonsense. I don’t need to know at 2am the latest political storm, that my Instagram video was viewed over 160 times, or which Real Housewife was just caught being naughty in Palm Beach or the Hamptons. 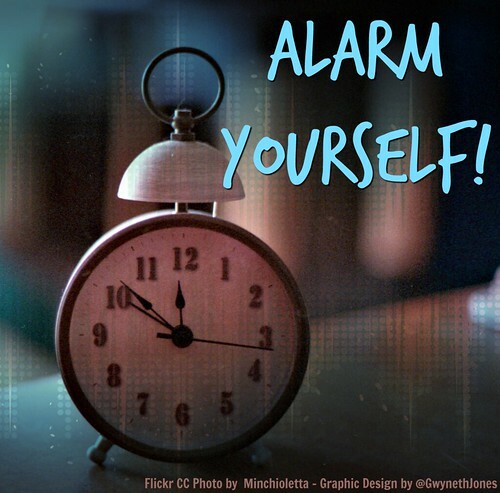 They disrupt your productivity and can wake you up in the middle of the night. Get your news on your own terms and when you want it, and not when the app decides you need it. Sadly, neither iOS nor Android offers a fast way to turn off all notifications at once. In both cases, you have to tap into your Settings, then go app-by-app to turn them off. It's kind of a pain, but completely worthwhile. 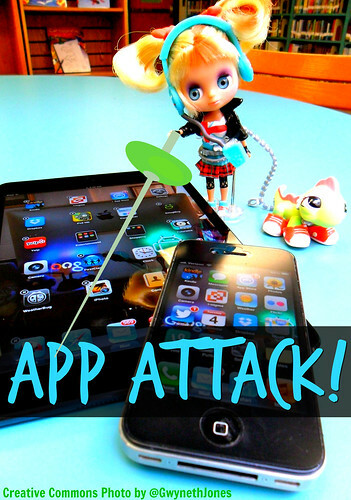 But hopefully you’ve weeded out those unused Apps in the previous step and this can be done semi-painlessly. Put on Fixer Upper, RHONY, or Chopped and slice through each App gleefully killing each notification push. Leave the important stuff on, texts and phone calls but really, do we need much else? Why not turn them all off and see how it goes? You can always tap them back in if you need the latest new hotspot on Yelp! While we’re at it, now that you’re not following every step an App takes, why not thin out the din of your Social Media herd? I consider Social Media as a conversation and if someone isn’t listening or contributing (they haven’t posted in six months) - what do they bring to my party? Though I do make exceptions for like @SirKenRobinson, @TimGunn, @GuyKawasaki, @BlueSkunkBlog, and @ladygaga and my personal hero, Andy Partridge of @XTCFans, who may never follow me back, but who inspire and put out great thoughtful content. I also follow countless non-celebrity talented educators who don’t follow me back but endlessly inspire. One of my respected colleagues online, Brent Warner, Professor of ESL and Proprietor of @EdTechTV says “We should take it upon ourselves to follow people who provide high quality insights and ideas in teaching and education. In turn, we should commit ourselves to providing the same through our own feeds. 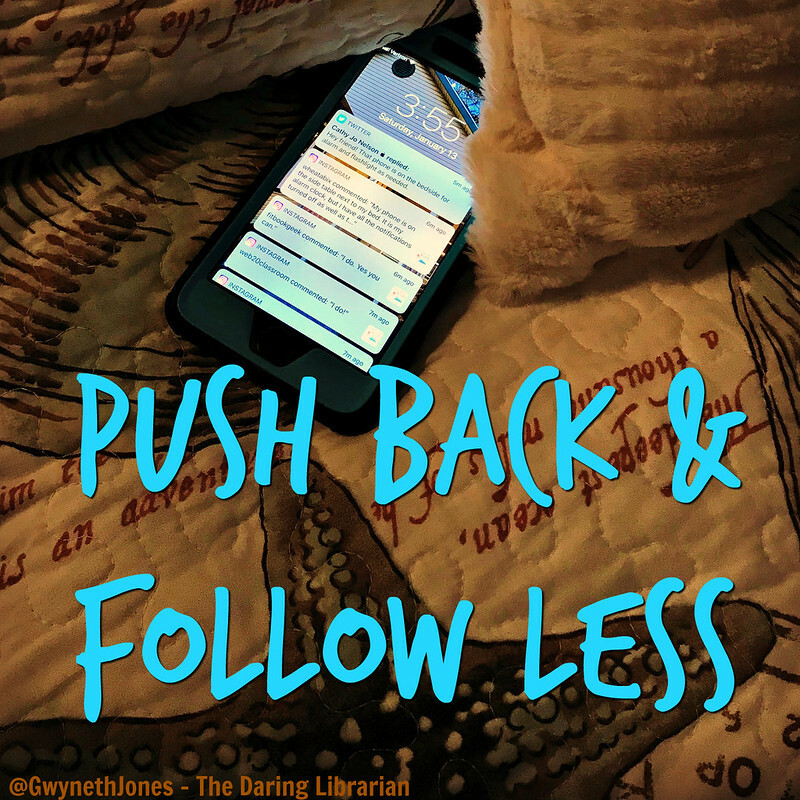 I see no problem with teachers who want to grow their online presence, but following people with an ulterior motive such as expecting a follow-back does everybody a disservice. I curate my conversations carefully, choosing as many diverse voices as I can from our rich and amazing global Education Personal Learning Networks (or PLN). I don’t just follow back everyone who follows me. I follow people who share original content, engage, contribute, and who interact - just like at a conference or a dinner party. We all learn together! Every now and then it's good to check to see who you follow but who isn't following you back, who hasn't posted in 6 months, and thin the conversation herd with this handy site, Manage Flitter. It's like weeding books in a library, it's hard to grow if the shelves are overflowing and untended. Some people ask me why I don't follow back as many people who follow me. And my answer is that I usually follow every educator who Tweets directly to me a time or two, and all those who I meet in person at a conferences or who have seen my Keynotes & presentations and Tweet to me and mention it. I want to cheer you on! I want to learn from you! But, I do not automatically follow people who follow me. I don't follow those or who have protected or locked Tweets, who only RT & never express an opinion (unless I meet them in person & they request it) and those who don't have a profile picture posted. If you can't care enough to fill out your profile, then I'm probably not going to follow you. Oh dear, that almost sounded elitist. But, it's not really, it's ALL about conversation and building a professional relationship. When I’m out to dinner and I see a family around a table, all on their devices and not talking with each other, it kind of makes me sad. 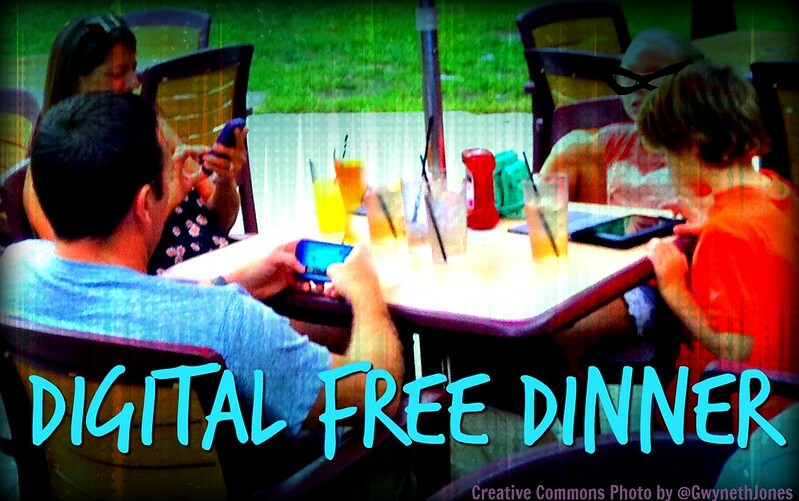 This has been a big thing with my family, to not have our devices out at the dinner table both at home and out at a restaurant. If my Dad is a Doctor and if he's "on call," he will step away from the table, but otherwise, Moms says -- NO Phones at the Table! My @hcpss_mhms Principal, Mrs. Lisa Smithson, says that when sitting down for a family dinner, everyone knows not to bring their phone to the table, but when out at a restaurant, one of the kids might “look something up” to contribute while the conversation flows. I think we all do that. That's one of the reasons I have the apps IMDB & Flickster on my phone! Talk it out and make a deal, one that everyone can live with, when it comes to a digital free dinner. Maybe let everyone check their devices until the server comes to the table to take orders, but after that, all phones are put away so dining together will be a more sociable occasion. Why not try ‘phone stacking’ in a restaurant or at a family meal? Everyone puts the device in the middle of the table, and the first person who reaches for their device has to buy the next round, pick up the check, clear the table, or just get teased. Whatever combination works for you, when you’re all together, BE together. If you’re working out or or just working, getting interrupted can be jarring and unproductive. When you turn on Airplane mode, not only are you saving battery life, but you can fully focus on your workout and not your social networks. Plus, you can still listen to your music and playlists. Do you want to enjoy Netflix or stream shows while you work out? Turn on “Do not disturb” by tapping on the little crescent moon icon on an iPhone. I have a friend, Sondra, who says watching diverting shows makes her workouts more entertaining and time passes faster. She’s muscled her way through Breaking Bad, Stranger Things, and Black Mirror at the gym. Sondra just advises against choosing a series like Game of Thrones that has, umm…. racy scenes, because that could get awkward! Whichever mode you choose, it’s good not to get snapped out of your work or your workout with notifications. 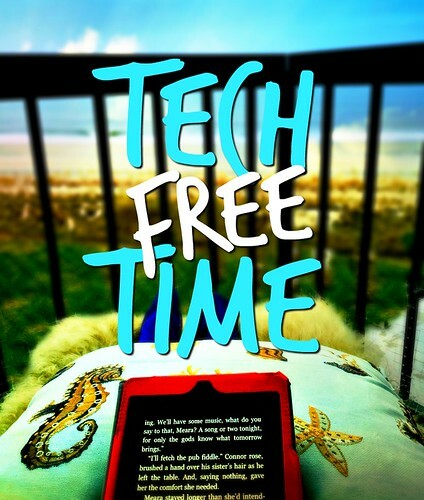 Consider scheduling some regular tech free time. This doesn’t mean sitting in a dark room meditating or a visit to an Ashram - but that’s an option! But why not choose to spend time out in nature, reading a book, going to a museum, farmer’s market, or doing an activity that’s not connected to technology? I often sit out in nature and read a book for hours. Admittedly, since I’ve gotten older I read mostly on my iPad because I love being able to adjust the font size. 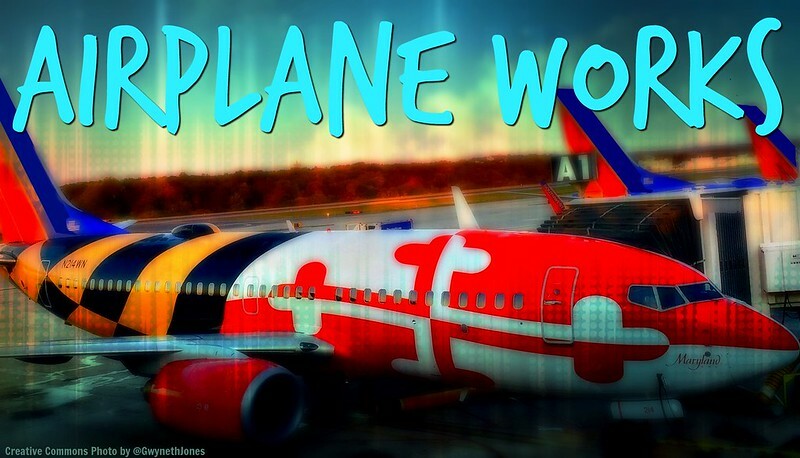 I put it on Airplane mode. Unless I want to Tweet a quote from the book I’m reading! See? It’s not easy to map mindfulness, dig into a digital detox, and to schedule tech free time - but it’s worth it. Liz Zinger, @liz_zinger, our Murray Hill Middle School Math Instructional Team (MIST) Leader, says that she often puts her devices “in a drawer” on weekends or on holiday, so that she’s fully in the moment and not distracted by notifications. Set yourself up for success by choosing a time period for your Digital Detox. Whether it’s just a Saturday, a Sunday, a weekend, or a whole vacation - just challenge yourself and choose a length of time and stick with it. But also, be reasonable. Some of you may need your phone for music, or an iPad or Kindle to read. That’s ok! But if you’re using your device, manage distractions by going on Airplane or Do Not Disturb mode the whole time and forgive yourself if you backslide. Schedule time (like an hour) in the middle of the vacation to check your work emails and respond. 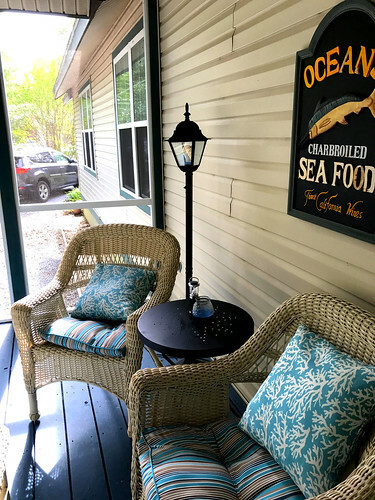 Whether you go cold turkey or just start “baby steppin”, taking away a wee bit of screen time and enjoying some authentic real time can only be beneficial. When you’re at the beach, BE at the beach. Or the mountains, or the desert, or the Lake, or the Woods, or the Hamptons, or wherever your happy place might be. 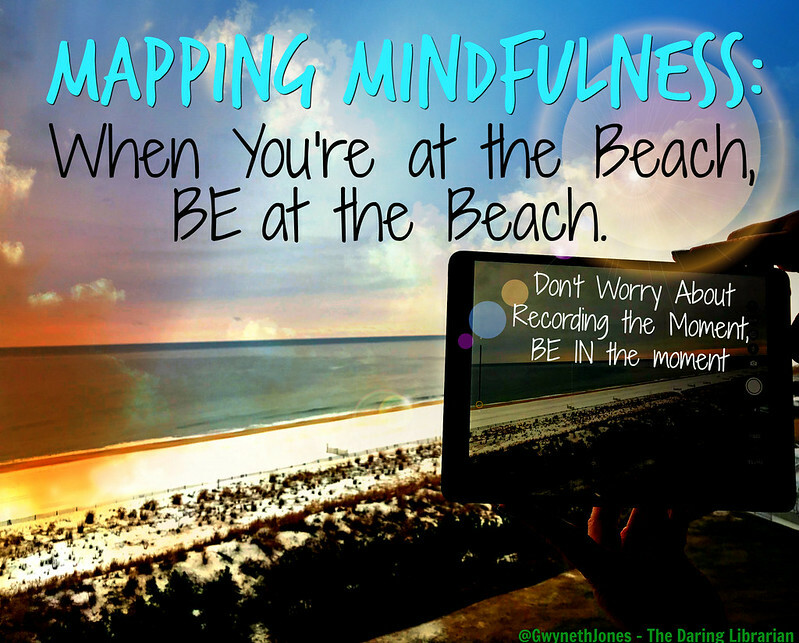 Snapchatting, and sharing videos of what you’re doing, you’re not practicing mindfulness. Using your phone, camera or social media in your daily activities can sometimes take away from the full experience of the present. Take pictures of the great places you’re visiting or the cool things that happen, catch the beautiful sunset, the cute puppy face, perfect yoga pose, or Mom’s classic lasagna, and post them all later. Wait until after the moment in a downtime. Still sharing, but not distracted. Not pulled out of the magical moment of right now. By giving ourselves permission to unplug from the noisy planet, the social swirl, or the digital daze, we can reevaluate our path, take stock in life, strengthen our relationships, and move forward with a sense of purpose and belonging. Deciding on a digital detox, mapping and practicing mindfulness can only be a good thing, but it’s your decision. Tweet or Instagram me what you think! Just kidding. Really, not really. UPDATE: 2/3/19 It's been almost a year without notifications on my phone and it's been OK! I turned OFF all notifications on my iPhone except for phone calls and texts from family and friends and I turned ON DO NOT DISTURB from 8pm until 6am. I do use my phone as an alarm backup. It comes on 1 min after my trusty travel alarm clock. Because, even though I've been teaching for 26+ years, I still have a fear of oversleeping. I DID keep notifications on my iPad which charges in the loo. Don't judge me! So, if I want to, I can check those Tweets and Instagram notices. But I can also just swipe away and play Plants v. Zombies. Again, don't judge me! LOL Think about avoiding the stress of the notification. Give yourself the gift of being more IN the moment than recording the moment. Then Tweet me and tell me how you like it! Cheers dears! @GwynethJones, a.k.a. The Daring Librarian, is a blogger, a Tweeter, an International Ed Tech keynote speaker, Google Certified Innovator, PBS Graduate Champion of Change, and the author of the award-winning Daring Librarian blog. 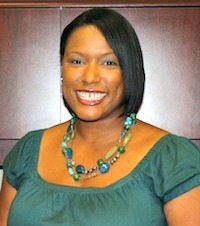 Gwyneth also is a career long NEA member and the teacher librarian at Murray Hill Middle School in Howard County, Md. PS. She's also ridiculously humble. Thank you, Anon! I appreciate the positive feedback & well wishes! This is FANTASTIC! As always you're my mentor, since I discovered you. Do I have permission to use some of these tips and kick back credit to you? Hello sweet friend! Of course you can quote me! I'm honored!